The Focus Medical Naturalase laser machine features the highest energy Q-switched system in the world, offering completely safe, highly effective tattoo removal with less complications. Made in the US by the experts at Focus Medical, the Naturalase laser machine is a highly versatile option for practices that want to offer a variety of treatments. Perfect for tattoo removal, the Naturalase laser machine is also ideal for a variety cosmetic purposes, including treatment of common skin conditions, removal of skins lesions and permanent hair removal. The NaturaLase offers advanced power and unparalleled beam technology to deliver impressive results in less time. Suitable for all skin types, the NaturaLase laser system offers the highest amount of energy output with four separate wavelengths. This allows for optimum results on multi-colored tattoos and even dark sun spots without the harsh side effects of other laser systems. 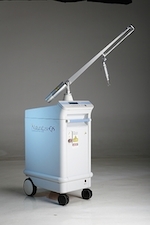 Interested in adding the Focus Medical NaturaLase laser system to your practice? The NaturaLase is the perfect addition to any busy cosmetic practice that is interested in expanding service offerings to include the latest popular services. SunrayLaser.com has amazing deals on used Focus Medical NaturaLase laser equipment with savings that are up to 60% off the original price! See for yourself how much you can save on high quality used laser equipment when you buy from SunrayLaser.com. Looking for pricing information and other details about our selection of preowned Focus Medical NaturaLase equipment? Please fill out the form below and we’ll provide a fast and free, no obligation quote. It’s an easy and no-risk way to learn more about this outstanding line of cosmetic lasers.